And this started me thinking, that all very well using these convenience delegates, but what if I want more parameters etc etc. SoÂ Func<T,TResult> is just a short hand forÂ a delegate declaration. Mmm. This means that we can create our own. So lets have a look at that. 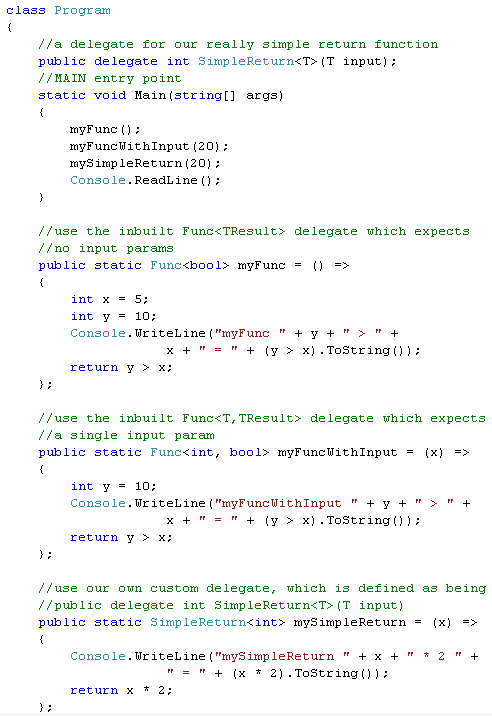 Here is a screen shot of a simple console application where I’ve created my own delegate type. Microsoft have done a great job with LINQ IMHO. However there are times when it might be handy to create your own LINQ extension methods. LINQ extension methods can be applied to any type provided that the source is of type IEnumerable<T>, so thats really the only requirement. So how do we write an extension method. Well its quite simple. 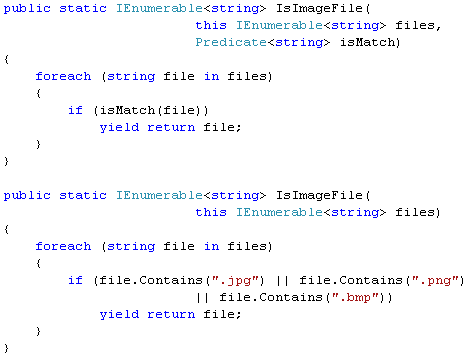 Here are 2 that I’ve written for aÂ IEnumerable<string> the first example takes a Predicate and the second one doesnt. This extension method will check whether a file name string is a valid image file, but you can do it for whatever your pupose is. The only other thing to note is the cryptic “this” keyword used in the method signature. This means its being applied to the current IEnumerable<T> collection. Just always put it in your extension methods and you’ll be fine. So how to use these extension methods, well providing your dealing with aÂ Enumerable<string> collection youll get the option coming up as an extension method. From time to time when you are using XLINQ to query XML data, you may find that you are dealing with a very large XML file. Loading a very large XML file using the standard XLINQ Load() method may not be appropraite due to the size of the XML file. Instead some sort of streaming XML approach may be prefferable. But XLINQ doesnt offer this facility straight out of the box, but with a bit of trickery we can get a XMLReader to do this streaming for us. Lets see an example shall we. And thats it, its a simple as that. We can now query a large XML file using XLINQ and be safe in the knowledge that it will be streamed using an XmlReader and the Yield keyword.